Bruno Degazio is a film sound designer, composer, researcher and educator based in Toronto, Canada. His many concert works for traditional and electronic media have been performed throughout North America, Europe and Asia. His film work includes the special-effects sound design for the Oscar-nominated documentary film, “The Fires of Kuwait” and music for the all-digital, six-channel sound tracks of the IMAX films “Titanica”, “Flight of the Aquanaut” and “CyberWorld 3D”, as well as many other IMAX films, feature films, and television dramas. 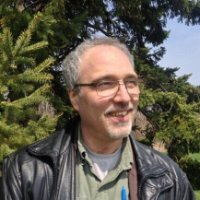 As a researcher in the field of automated music composition using fractals and genetic algorithms, Mr. Degazio has presented papers and musical works at leading international conferences, including festivals in Toronto, Montreal, New York City, London, The Hague, Berlin, Tokyo and Hong Kong. Bruno is the designer of MIDIForth and The Transformation Engine, software systems with applications to automate composition and data sonification. He is currently investigating the potential of the algorithmic combination of OpenGL graphics with automated music composition. Mr. Degazio is Professor of Digital Tools in the B.A. Animation program of Sheridan College in Toronto, Canada. For our 2018/2019 Season, Bruno has arranged an excellent opportunity for top Sheridan Animation students to project their films with live orchestra accompaniment, featuring music composed by members of the SPO team and an SPO New Generation Artist, Sergei Kofman. This experience for our audience will be like being on a Hollywood sound stage. The experience for the student animators will be equally as exciting. You won’t want to miss our fifth concert in this series, “Classic Film Music & New Animated Shorts” (May 4, 2019, 8pm at the Salvation Army Scarborough Citadel).